Until recently I have always had wooden coops but I have often toyed with the idea of a plastic coop as I had heard great things about their cleanability and freedom from red mite. So when I was offered the chance for my girls to trial a new plastic coop designed specifically for ex-batts, I jumped at the chance. 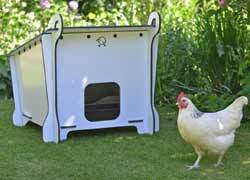 The cluckbuddy coop is made in Britain out of recycled plastic. Two definite ticks in the environmentally friendly box. It is made by CluckBuddy a company of impressively focussed and motivated designers who have spent a great deal of time and effort perfecting this coop so it meets the needs of that most precious of hens; the ex-battery hen. My main priority in a coop is security. As far as I am concerned, you can never be too secure from the threat of Mr Fox and I have to say, despite my OCD tendencies for my hens’ safety, this coop is spot on. It is sturdy. Sturdy enough not to be pulled apart by predators but not too heavy that one person cannot move it. 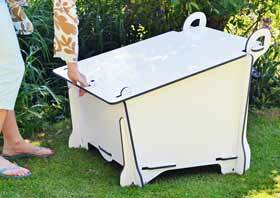 In fact it is designed so that you can lift it from the back and move it around the run/garden. When I first saw the lid of the coop I was concerned the catch wasn’t strong enough. In fact it is brilliant! It slots in and pushes up to lock and lifts up and slides up to unlock. This is easy to do once you have the knack but impossible if you are a fox. A fabulous piece of design, I wish all coops had them. There are no screws and bolts and the pieces of the coop slots into each other – its strength and rigidity coming from the way that everything fits together. It is easy to assemble; everything has to be assembled in a certain order but the instructions are clear and easy to read – even for me! My next priority in a coop is comfort for my girls. Ex-batts have had a rough ride in their early life so deserve all the love and attention they can get. The coop is designed for three ex-batts, I had two hens trialling it and there was more than enough room – plenty for an additional coop mate. Ventilation is more important in a plastic coop than a wooden one as plastic doesn’t breathe. There are a number of holes along the front and side of the coop to allow air to circulate. Plastic coops can also suffer from being leaky but, this one was tested in the wettest April on record (and in Cornwall, known for its wind and rain) and came out extremely well. Very occasionally there was the tiniest trickle of water at the back of the coop (I am talking tiny – a dribble) and noticeably less than in my wooden coops. To let in that miniscule amount of water in what were, let’s face it, extreme conditions, is very impressive! Ex-batts do not always perch at night and often sleep in the nest boxes. This nest box fits three hens perfectly across its width. The divider is moveable so if your girls do sleep together in the nest box you can make it larger but then if they later decide to perch the nest box divider can be moved back to give more room. The perch itself is good and sturdy and can be removed for cleaning. 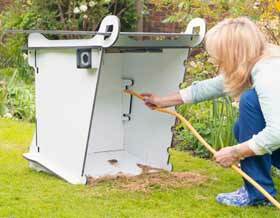 The pophole is worked by a pulley on the outside of the coop – a washer prevents the cord from coming off the pulley. An automatic door opener can also be fitted if 5am midsummer wake ups are not your thing. The coop is also very low off the ground so is so much easier for ex-batts with weak legs to get in and out of. The designers did look at a little ramp to make up the small hop from coop to ground but found it became slippery in the wet and obviously not good for girls already unsteady on their feet. Once your girls have got stronger hopping from coop to run and vice versa will not be a problem but in the interim few weeks a little wooden block or brick is recommended. My final coop criteria is cleanbility; plastic coops are traditionally easier to clean than their wooden counterparts and this one is no exception. Weekly clean outs take minutes, being plastic it is quick to hose down and equally quick to dry. Anyone who has spent all day waiting for a wooden coop to dry out whilst an impatient hen paces around eager to lay her egg, will know how important this is! Plastic coops are also not harbourers of red mite, unlike wooden ones. Red mites hide in the cracks of the wood at night – so no cracks equals no red mite. Ever cautious though I do still spray the coop with poultryshield and dust diatom powder everywhere. Just to be on the safe side! The coop I trialled did not come with a run as the run is still in its development stage. What I do know though is that the run design is a stroke of genius. With the needs of the ex-batt always at the fore – the run will be modular, allowing for a section to be partitioned off. In the first few days ex-batts will probably squabble to establish the pecking order and sometimes a bully needs to be isolated if the squabbles become unpleasant. This design will make it easy to do that until things settle down which they undoubtedly will. Being modular you will also be able to add to it as your flock grows, a unique concept as far as I am aware. Watch this space! The coop is white – which initially I was unsure of, but its colour has certainly grown on me, not least for the added security benefits – when I look out of the window at night to check for the umpteenth time on the hens, I can see the coop clearly. Also, and this is a wonderful idea, the designers will be selling stickers so you can customise your coop – with its name (ours is called Much Bwarking), or the names of your girls or flowers or anything really. This is a wonderful way for the young and young at heart to make their coop special and individual for their new pets. A Pimp my Coop, if you will! On a serious note, being white keeps the costs down and for £297 including delivery I think this coop is amazing value. Cheaper and more affordable than other plastic coops on the market and designed specifically for the individual needs of ex-battery hens, a great amount of care and attention has gone into its design to make sure the hens are as safe and as comfortable as possible. But it is the attention to detail that makes this coop stand out from its competitors – the moveable nest box, the low entrance, the sturdy perch. If you are new to keeping ex-batts or indeed adding them to your flock then I cannot recommend this coop strongly enough. Jo lives in Cornwall and is completely batty about her ex-battery hens. She is a passionate campaigner, helping out with rescues and highlighting their plight in her articles.